NFL Wildcard Round and College National Championship! Welcome to the best online sportsbook! A football lovers weekend is about to start. Today, Saturday, January 5th, 2019 we will see NFL Playoff Wild Card games: Colts/Texans, Seahawks/Cowboys and on Sunday, January 6th, 2019, we have the Chargers/Ravens and Eagles/Bears. On Monday, Jan. 7th, will be your last chance to run it up in College Football, with the National Championship Game between Alabama and Clemson. Kickoff from Levi’s Stadium in Santa Clara, California, is set for 8 p.m. ET. Will Clemson’s top defense be able to stop Bama’s explosive offense? and Clemson Tigers will square off in the College Football Playoffs. The Crimson Tide have won two of the previous three meetings, including last year’s dominant 24-6 semifinal victory. Now No. 2 Clemson (14-0) gets another crack at No. 1 Alabama (14-0) in the 2019 national championship game. The Crimson Tide are six-point favorites with the total at 58.5 in the latest Alabama vs. Clemson odds. 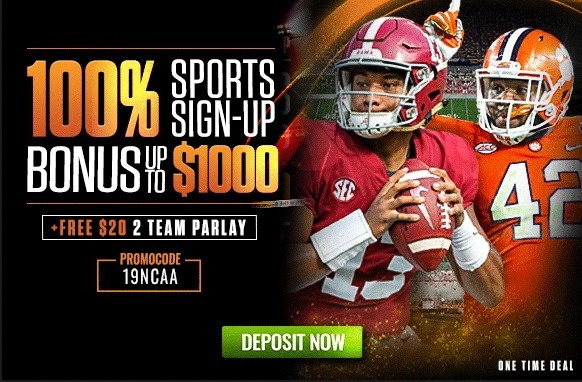 Before you make any 2019 College Football Playoff National Championship Game predictions, be sure to check out our Alabama vs. Clemson game articles in MybookieNCAAF News section. CLEM are 8-1 ATS in their last 9 bowl games. CLEM are 7-2 ATS in their last 9 games overall. CLEM are 6-2 ATS vs. a team with a winning record. ALA are 7-2 ATS in their last 9 vs. ACC. Over is 20-6-2 in ALA last 28 neutral site games. Over is 5-2-1 in ALA last 8 vs. ACC. TAP HERE & REDEEM YOUR BONUS! Important notes: This bonus is a one time deal. Before you make your minimum deposit of $100, make sure that you click “Yes” under “Claim a Bonus?”, then confirm “Yes”, then click “Add a Promo Code” and enter the code into the box. Then click the green “REDEEM” button in the cashier to activate it. Expires on January 7th at 23:59 ET. with the latest sports betting news, banter and specials. PreviousBet the NFL Wild Card Playoffs with the Best Odds!